Panasonic Corporation today announced that it has achieved a conversion efficiency of 25.6% (cell area: 143.7 cm²) in its HIT solar cells, a major increase over the previous world record for crystalline silicon-based solar cells. The previous record for the conversion efficiency of crystalline silicon-based solar cells of a practical size (100 cm² and over) was 24.7%, as announced by Panasonic in February 2013 (cell area: 101.8 cm²). The new record is 0.9 points higher and the first to break through the 25% barrier for practical size cells. 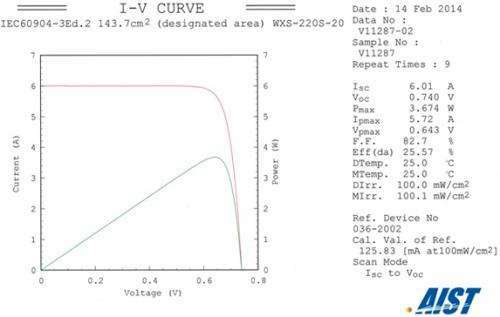 This new record is also an improvement of 0.6 points over the previous record for small area crystalline silicon-based solar cells (cell area: 4 cm²) of 25.0%. The achievement of this new record was made possible by further development of Panasonic's proprietary heterojunction technology to realize the high conversion efficiency and superior high temperature properties of the company's HIT solar cells as well as adopting a back-contact solar cell structure, with the electrodes on the back of the solar cell, which allows the more efficient utilization of sunlight. A key feature of HIT technology is its ability to reduce the recombination loss of charge carriers, particles of electricity generated by light, through laminating layers of high-quality amorphous silicon on the surface of the monocrystalline silicon substrate, where power is generated. By utilizing the technology to form a high-quality amorphous silicon film on the monocrystalline substrate while minimizing damage to the surface of the substrate, it has been possible to realize a high temperature coefficient of -0.25% per degree Celsius which is able to maintain a high conversion efficiency even with high open circuit voltage (Voc) and at high temperatures. In order to increase the current in a solar cell, it is necessary to lead the sunlight which arrive at the cell's surface to the monocrystalline silicon substrate, which is the layer which generates the power with less loss. Placing the electrodes on the reverse as back contacts allows the light to reach the substrate more efficiently. This has led to a marked improvement in short circuit current density (Jsc) to 41.8mA/cm² over Panasonic's previous figure of 39.5mA/cm² (in the case of a cell with a conversion efficiency of 24.7%). In solar cells, the generated electrical current is accumulated in the surface grid electrodes and output externally. Previously, the grid electrodes on the light-receiving side were optimized by balancing the thickness of the grid electrodes (thinning the grid electrodes to reduce the amount of light blocked) and the reduction of electrical resistance loss, but by placing the electrodes on the reverse side, it has become possible to reduce the resistive loss when the current is fed to the grid electrodes. In addition, a high fill factor (FF) of 0.827, has been achieved, even at a practical cell size by improving resistance loss in the amorphous silicon layer. Going forward, Panasonic will continue to pursue technology development of its HIT solar cells, aimed at realizing higher efficiency, lower costs and the more efficient use of resources, and will work towards mass production.